high quality surfactants. The product is free of chlorine and acid. Self-actingly removes all kinds of common and environmental dirt caused by plants and trees. Slippery green eposits can also be removed. 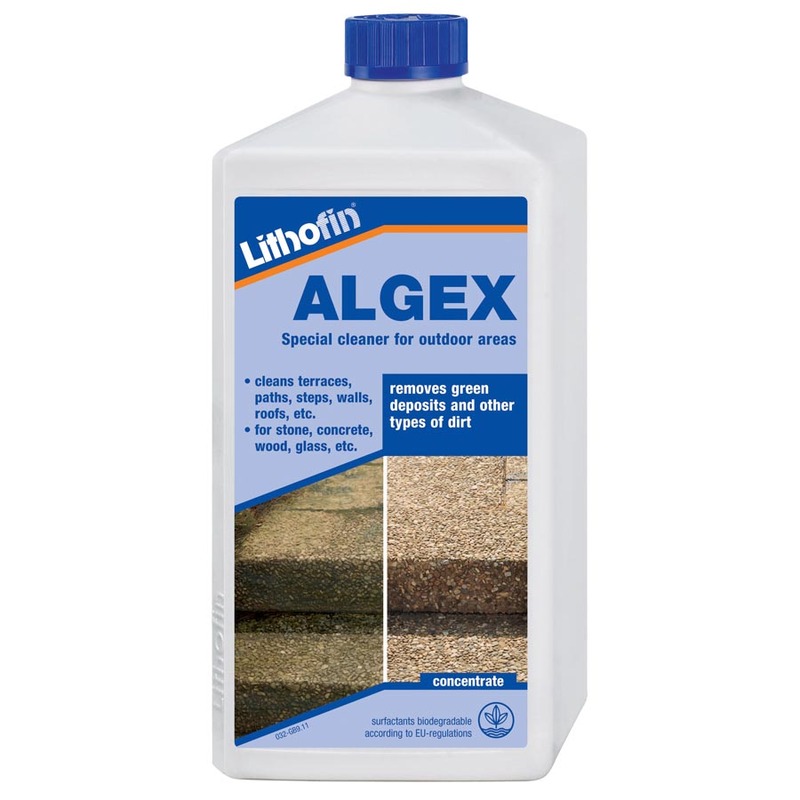 Due to its characteristics, Lithofin ALGEX also has a preventive effect, keeping surfaces clear of new green deposits for up to one year. however, they should not be sprayed or should be washed off immediatley. Application Temperature: 10 to 25°C. Do not use on warm surfaces. Coverage: approx. 20 to 50m² when using a watering-can; up to 200m² when using a sprayer. Closed cool and dry. Up to 5 years. 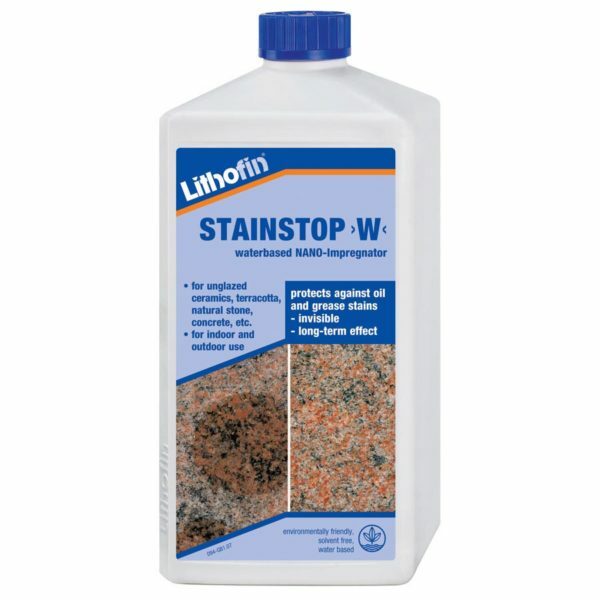 Impregnating the surface with Lithofin STAINSTOP >W< will render it resistant to the penetration of water, thereby greatly reducing the risk of dirt accumulation and algae formation. 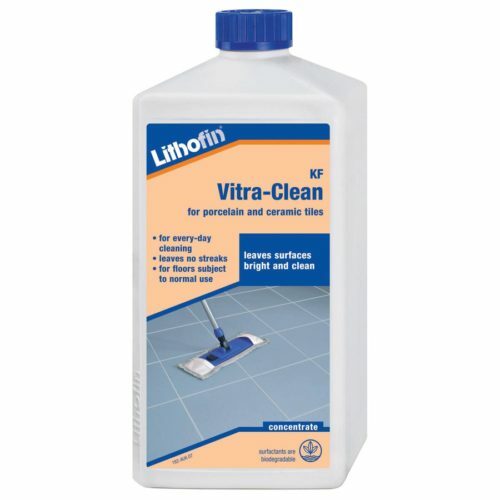 The contained surfactants are biologically degradable according to EU-regulations. Does not contain any phosphates. Disposal: diluted product may be added to waste water. Containers are made of environmentally friendly polyetylene (PE). Clean containers can be recycled through collection system. Ingredients: 15-30% cationic surfactants, perfumes. Labeling according to VO(EG) Nr.1272/2008(CLP): Symbol GHS 05, 09, Danger Quaternary ammonium compounds, benzyl-C 8-18- alkyldimethyl, chlorides. Causes severe skin burns and eye damage. Very toxic to aquatic life. Keep out of reach of children. Wear protective gloves/protective clothing/eye protection/face protection. IF IN EYES: Rinse cautiously with water for several minutes. Remove contact lenses, if present and easy to do. Continue rinsing. Immediately call a POISON CENTER or doctor/physician. Store locked up. Dispose of contents and container in accordance with local and national regulations. 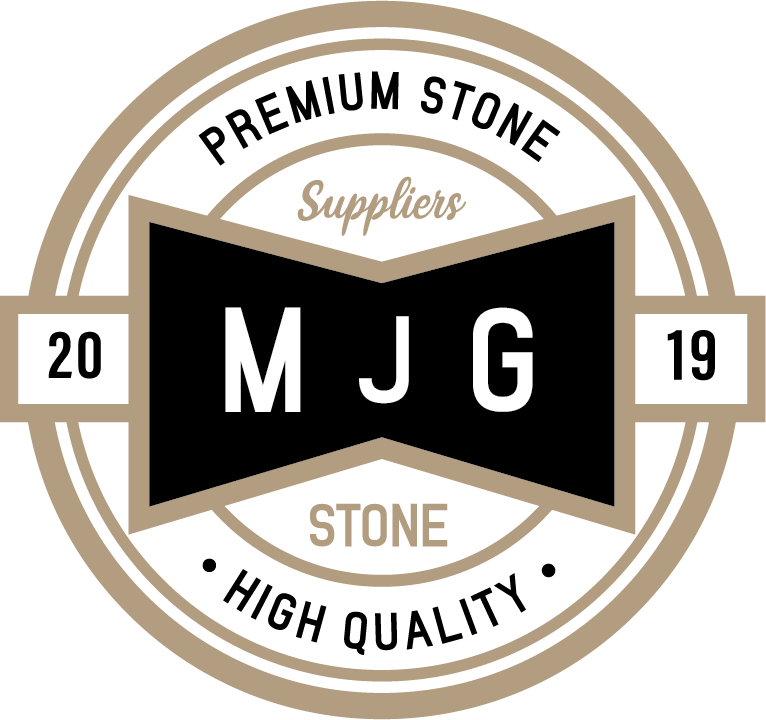 Additional information is listed on the Material Safety Data Sheet.